An antipope (Latin : antipapa) is a person who, in opposition to the one who is generally seen as the legitimately elected Pope, makes a significantly accepted competing claim to be the Pope,  the Bishop of Rome and leader of the Roman Catholic Church. 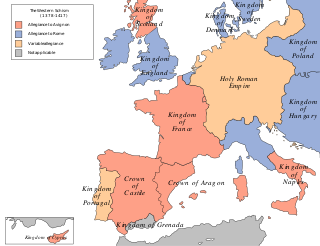 At times between the 3rd and mid-15th centuries, antipopes were supported by a fairly significant faction of religious cardinals and secular or anti-religious monarchs and kingdoms. 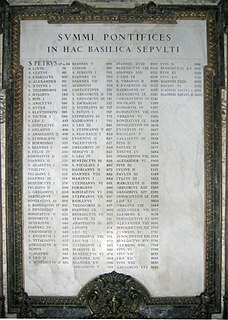 Persons who claim to be pope, but have few followers, such as the modern sedevacantist antipopes, are not classified with the historical antipopes. The pope, also known as the supreme pontiff, is the Bishop of Rome and ex officio leader of the worldwide Catholic Church. Since 1929, the pope has also been head of state of Vatican City, a city-state enclaved within Rome, Italy. The current pope is Francis, who was elected on 13 March 2013, succeeding Benedict XVI. Hippolytus of Rome (d. 235) is commonly considered to be the earliest antipope, as he headed a separate group within the Church in Rome against Pope Callixtus I. Hippolytus was reconciled to Callixtus's second successor, Pope Pontian, and both he and Pontian are honoured as saints by the Catholic Church with a shared feast day on 13 August. Whether two or more persons have been confused in this account of Hippolytus  and whether Hippolytus actually declared himself to be the Bishop of Rome, remains unclear, since no such claim by Hippolytus has been cited in the writings attributed to him. Hippolytus was one of the most important second-third century Christian theologians, whose provenance, identity and corpus remain elusive to scholars and historians. Suggested communities include Palestine, Egypt, Anatolia, Rome and regions of the mideast. The best historians of literature in the ancient church, including Eusebius of Caesarea and Jerome, openly confess they cannot name where Hippolytus the biblical commentator and theologian served in leadership. They had read his works but did not possess evidence of his community. Photios I of Constantinople describes him in his Bibliotheca as a disciple of Irenaeus, who was said to be a disciple of Polycarp, and from the context of this passage it is supposed that he suggested that Hippolytus so styled himself. This assertion is doubtful. 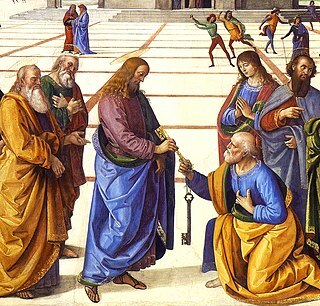 One older theory asserts he came into conflict with the popes of his time and seems to have headed a schismatic group as a rival to the Bishop of Rome, thus becoming an Antipope. In this view, he opposed the Roman Popes who softened the penitential system to accommodate the large number of new pagan converts. However, he was reconciled to the Church before he died as a martyr. Pope Callixtus I, also called Callistus I, was the Bishop of Rome from c. 218 to his death c. 222 or 223. He lived during the reigns of the Roman Emperors Elagabalus and Alexander Severus. Eusebius and the Liberian catalogue gave him five years of episcopate (217–222). He was martyred for his Christian faith and is venerated as a saint by the Catholic Church. Pope Pontian was Pope from 21 July 230 to 28 September 235. 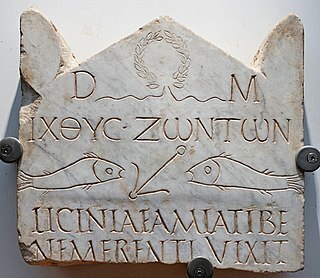 In 235, during the persecution of Christians in the reign of the Emperor Maximinus Thrax, Pontian was arrested and sent to the island of Sardinia. He resigned to make the election of a new pope possible. Eusebius of Caesarea, also known as Eusebius Pamphili, was a historian of Christianity, exegete, and Christian polemicist. He became the bishop of Caesarea Maritima about 314 AD. Together with Pamphilus, he was a scholar of the Biblical canon and is regarded as an extremely learned Christian of his time. He wrote Demonstrations of the Gospel, Preparations for the Gospel, and On Discrepancies between the Gospels, studies of the Biblical text. As "Father of Church History", he produced the Ecclesiastical History, On the Life of Pamphilus, the Chronicle and On the Martyrs. Christianity in the 3rd century was largely the time of the Ante-Nicene Fathers who wrote after the Apostolic Fathers of the 1st and 2nd centuries but before the First Council of Nicaea in 325. Adoptionism, also called dynamic monarchianism, is a Christian nontrinitarian theological doctrine which holds that Jesus was adopted as the Son of God at his baptism, his resurrection, or his ascension. Novatian was a scholar, priest, theologian and antipope between 251 and 258. Some Greek authors give his name as Novatus, who was an African presbyter. Pope Cornelius was the Bishop of Rome from 6 or 13 March 251 to his martyrdom in 253. He was Pope during and following a period of persecution of the church and a schism occurred over how repentant church members who had practiced pagan sacrifices to protect themselves could be readmitted to the church. Cornelius agreed with Cyprian of Carthage that those who had lapsed could be restored to communion after varying forms of penance. That position was in contrast to the Novationists, who held that those who failed to maintain their confession of faith under persecution would not be received again into communion with the church. That resulted in a schism in the Church of Rome that spread as each side sought to gather support. Cornelius held a synod that confirmed his election and excommunicated Novatian, but the controversy regarding lapsed members continued for years. An anti-king, anti king or antiking is a would-be king who, due to succession disputes or simple political opposition, declares himself king in opposition to a reigning monarch. The term is usually used in a European historical context where it relates to elective monarchies rather than hereditary ones. In hereditary monarchies such figures are more frequently referred to as pretenders or claimants. Pope Urban VI, born Bartolomeo Prignano, was Pope from 8 April 1378 to his death in 1389. He is so far the last pope to be elected from outside the College of Cardinals. His reign, which began shortly after the end of the Avignon Papacy, was marked by immense conflict between rival factions as part of the Western Schism. Robert of Geneva was elected to the papacy as Clement VII by the French cardinals who opposed Urban VI, and was the first antipope residing in Avignon, France. His election led to the Western Schism. As the Patriarch of Alexandria, Egypt, has historically also held the title of Pope, a person who, in opposition to someone who is generally accepted as a legitimate Pope of Alexandria, claims to hold that position may also be considered an Antipope. In 2006, the defrocked married Coptic lector Max Michel became an Antipope of Alexandria, calling himself Maximos I. His claim to the Alexandrine Papacy was dismissed by both the Coptic Orthodox Pope Shenouda III and Pope Theodore II of the Greek Orthodox Church of Alexandria. The Coptic Pope of Alexandria and the Greek Pope of Alexandria currently view one another, not as Antipopes, but rather as successors to differing lines of apostolic succession that formed as a result of christological disputes in the fifth century. Baldassarre Cossa was Pisan antipope John XXIII (1410–1415) during the Western Schism. 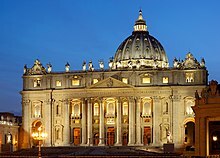 The Catholic Church regards him as an antipope, as he opposed Pope Gregory XII whom the Catholic Church now recognizes as the rightful successor of Saint Peter. He was eventually deposed and tried for various crimes, though later accounts question the veracity of those accusations. Pope Siricius was Pope from December 384 to his death in 399. He was successor to Pope Damasus I and was himself succeeded by Pope Anastasius I.
Pope Gelasius II, born Giovanni Caetani or Giovanni da Gaeta, was Pope from 24 January 1118 to his death in 1119. A monk of Monte Cassino and chancellor of Pope Paschal II, Caetani was unanimously elected to succeed him. In doing so he also succeeded to the conflicts with Emperor Henry V over investiture. Gelasius spent a good part of his brief papacy in exile. Patriarchate is an ecclesiological term in Christianity, designating the office and jurisdiction of an ecclesiastical patriarch. Gregory VIII, born Mauritius Burdinus, was antipope from 10 March 1118 until 22 April 1121. Pedro Martínez de Luna y Pérez de Gotor, known as el Papa Luna in Spanish and Pope Luna in English, was an Aragonese nobleman, who as Benedict XIII, is considered an antipope by the Catholic Church. A papal name or pontificial name is the regnal name taken by a pope. Both the head of the Catholic Church, usually known as the Pope, and the Pope of the Coptic Orthodox Church of Alexandria choose papal names. As of 2013, Pope Francis is the Catholic Pope, and Tawadros II or Theodoros II is the Coptic Pope. This article discusses and lists the names of Catholic Popes; another article has a list of Coptic Orthodox Popes of Alexandria. The papal conclave of 1431 convened after the death of Pope Martin V, elected as his successor cardinal Gabriele Condulmer, who took the name Eugene IV. It was the first papal conclave held after the end of the Great Western Schism. The papal conclave of 1406, the papal conclave of the time of the Great Western Schism, convened after the death of Pope Innocent VII. It elected Cardinal Angelo Correr, who under the name of Gregory XII became the fourth pope of the Roman Obedience. Natalius was a figure in early church history who is sometimes considered to be the first Antipope of Rome. ↑ "One who opposes the legitimately elected bishop of Rome, endeavours to secure the papal throne, and to some degree succeeds materially in the attempt" (Encyclopædia Britannica: Antipope). ↑ "The catacombs the destination of the great jubilee". Vatican City. Archived from the original on 10 September 2007. Retrieved 3 September 2007. ↑ Dix, Gregory; Chadwick, Henry (2013). The Treatise on the Apostolic Tradition of St Hippolytus of Rome, Bishop and Martyr. Routledge. p. xvii. ISBN 9781136101465 . Retrieved 7 June 2017. ↑ "Monarchians – Dynamists, or Adoptionists". Catholic Encyclopedia. Archived from the original on 30 September 2007. Retrieved 3 September 2007. ↑ "CATHOLIC ENCYCLOPEDIA: Pope Martin V". www.newadvent.org. ↑ "CATHOLIC ENCYCLOPEDIA: List of Popes" . Retrieved 20 August 2015. ↑ "Darras "title of sylvester iii" - Google Search". www.google.com. 1 2 Miranda, Salvador. 1998. "14th Century (1303–1404)." ↑ Miranda, Salvator. 1998. "The Cardinals of the Holy Roman Church: Biographical Dictionary: Antipope] John XXIII (1410–1415): Consistory of 6 June 1411 (I)." ↑ Miranda, Salvador. 1998. "15th Century (1404–1503)." ↑ "Code of Canon Law - IntraText". www.vatican.va. ↑ "Self-styled 'Pope' dies in France". Chicago Tribune. Chicago, IL. Reuters. 24 June 1974. Archived from the original on 17 February 2019. Retrieved 16 February 2019– via Newspapers.com. ↑ "10 Most Bizarre People on Earth". Oddee. 2006-12-06. Retrieved 20 August 2015. ↑ Chryssides, George D. (25 November 2011). "Historical Dictionary of New Religious Movements". Scarecrow Press – via Google Books. ↑ "Iglesia Católica Apostólica Española Tradicionalista y Mercedaria – Iglesia Católica Apostólica Española Tradicionalista y Mercedaria" . Retrieved 20 August 2015. ↑ Rosentrater, Erwin (2015). The Esoteric Codex: Antipopes. lulu.com. p. 3. ISBN 978-1-312-98922-1. ↑ Iglesia Católica Remanente. "Iglesia Católica Apostólica Remanente" . Retrieved 20 August 2015. ↑ "Common Statement Between The Coptic Orthodox Church and the Greek Orthodox Patriarchate of Alexandria and all Africa Regarding Max Michel" (PDF). Archived from the original (PDF) on 2008-05-11. Retrieved 3 October 2016. ↑ Zladko Vladcik – I am the Antipope. YouTube. 21 January 2007. Retrieved 20 August 2015.